Update, the current Notre Dame Cathedral is undergoing large-scale renovation, the renovation is expected to last for 2 years (6/2017-end 2019). The Masses are still held weekly but guests are not allowed to visit for safety. You can still admire the scenery or take pictures from afar. Established between 1863 and 1880 by French colonists, the central Saigon Notre Dame Cathedral is one of the most famous landmarks in Ho Chi Minh City, thanks to its special architecture, rich spirituality and oozing history. 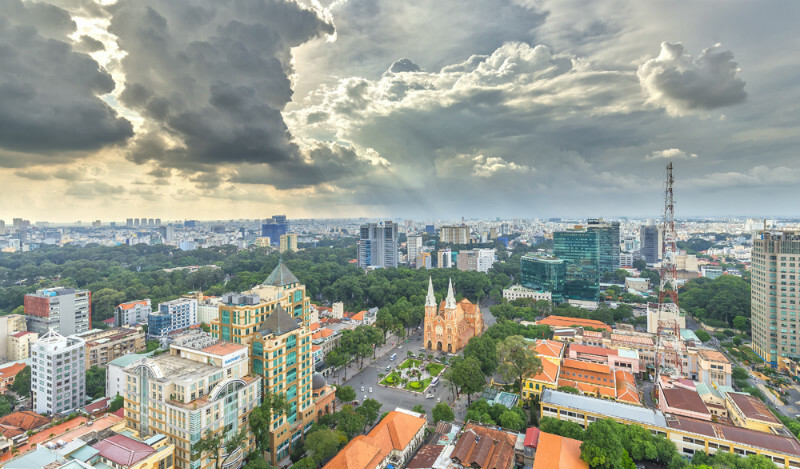 Located in the most crowded district of Saigon – District 1, the Cathedral is also in close proximity to Saigon Post Office and Reunification Palace. The impressive red bricks of the cathedral make it outstanding in the modern city that has been rapidly growing up. It was built by French colonists; thus, all the materials and decorations were imported from France. The outside of the buildings, for instance, was built totally of red bricks from Marseille without plastered or cemented. However, it still remains fresh orange-red color until today. The focusing point of the building is its two identical 58-metre bell towers in which each tower has 6 bronze bells that still ring loudly these days. The appearance of these 2 bell towers does increase the value of the cathedral’s unique architecture. When you visit the cathedral, don’t forget to spend time walking around the building to enjoy its fresh color as well as special architecture. In general, cathedral is open to visitors from Monday to Saturday, between 8 AM to 11 AM and 2 PM to 4 PM. If you have a chance to take a look inside, then remember to enter the sided gate, which is open every day while the main gate opens only during Sunday Mass. Many tourists visiting Notre Dame Cathedral would like to attend the mass, but do not know the exact mass schedule of the Notre Dame. With the following information, hopefully you will choose the mass frame that suits you best. In detail. • Weekday Mass take place at 5.30 AM and 5.30 PM. • There are 7 Masses every Sunday, including 5.30 AM; 6.45 AM; 8 AM; 9.30 AM; 4.00 PM; 5.30 PM; as well as 6.30 PM. Particularly, the Sunday Mass which takes place in 9.30 AM is in English. 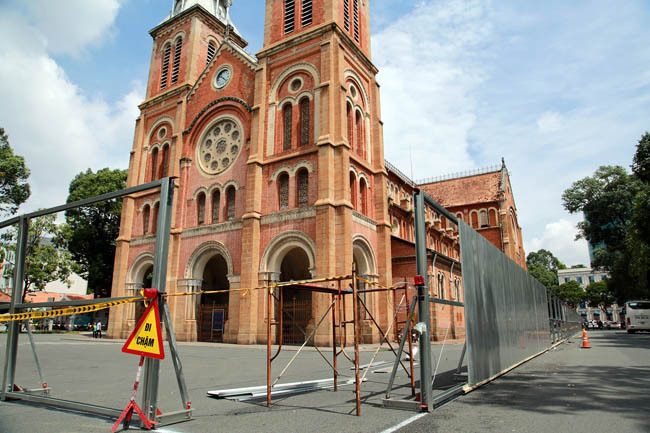 This is an interesting thing to do when you are in Saigon because you can not only marvel at its gorgeous architecture, but also see a lot of worshippers and Gregorian chanting. However, remember that it is like any holy places around the world. That’s why you should dress appropriately and avoid disturbing the worshippers when visiting and taking photographs. When you are done with the mass, don’t leave immediately since other fascinating things are still waiting for your discovery. The main gate of Cathedral, looking over a small square, is a perfect place to take panoramic photo of the building. In addition, it is also a favorite place for couples to take sweet and picturesque pre-wedding photos. 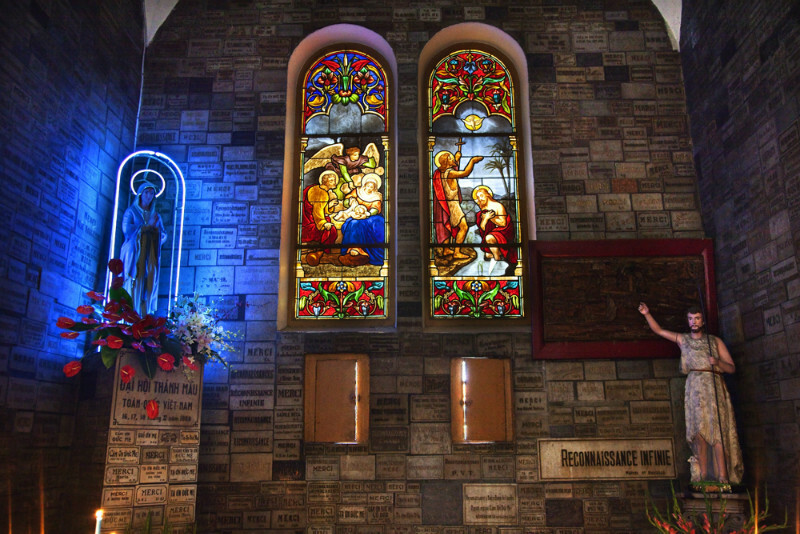 It is believed that a Virgin Mary statue, standing in this square, shed tears in 2005. The special feature of the Saigon Notre Dame Cathedral is highlighted by not only its architecture but its favorable location. From here, you are able to reach the Independence Palace, the Ho Chi Minh Post Office and the book street with ease. If you are interested in the history of Saigon in the war, then Independence Palace is indeed a good choice. This palace not only has a unique architecture, but it is also associated with many significant historical events of the country. In addition to Saigon Notre Dame Cathedral, Ho Chi Minh Post Office is also a signal building of Saigon. It gets is name famed and popular for its combined architecture style of Europe and Asia with large curved dome along the door and ceiling. What’s more? 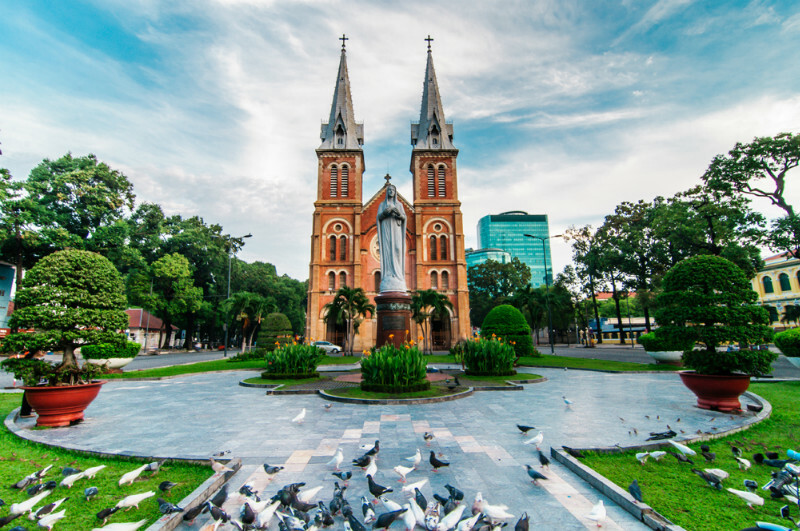 The cathedral is also situated next to April 30th Park and Diamond Plaza where the local youngsters usually congregate, drink coffee, view busy street, as well as enjoy peaceful moment of Saigon. Sitting here to sip a cup of coffee with the local people, you have an opportunity to understand more about their lifestyles and see the city with a new perspective. The price for 1 cup of coffee is around 8.000 VND to 10.000 VND (0.4 USD – 0.5 USD). Plus, if you don’t mind street food, don’t hesitate to try many around the church. Sampling street food is, without a doubt, one of the best things to do in Saigon. The reason is that street food is not only about food, but also about atmosphere and ambience as well.